A group of 15 traditionalist Anglican bishops, members of Forward in Faith, the largest Anglo-Catholic group in the Church of England, said that Anglo-Catholic clergy are sharply divided over how to respond to the ordination of women as bishops. They said members faced a range of options in response to the mid-July vote by the Anglican general synod to create women bishops by 2014. 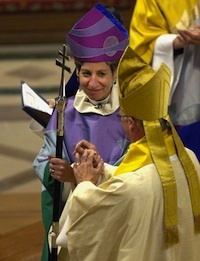 In a letter on July 31 to more than 1,300 Anglo-Catholic priests and deacons who had previously registered their opposition to women bishops, the bishops described themselves “united in our belief that the Church of England is mistaken in its actions.” The bishops said it was inevitable that many traditionalists, including some bishops, would take up Pope Benedict XVI’s offer of a personal ordinariate within the Catholic Church. The arrangement will allow Anglicans to be received into the Catholic Church as a group while retaining their distinctive patrimony and liturgical practices, including married priests. This article also appeared in print, under the headline "Traditionalist Anglicans Split on Next Move," in the August 16, 2010 issue.